Shri Piyush Goyal assumed charge of the Ministry of Coal here today. Briefing the media on the occasion, the Minister said establishing synergy between Power and Coal sector is very important. Making Energy Sector more vibrant is the priority of the Government. Shri Goyal expressed the hope that his Ministry would work in tandem with Environment Ministry to ensure faster clearance of mining projects. But Environmental interests of the nation will also be kept in mind. He said that promoting the private investment in Power sector is also very important; the Government would provide all possible support to encourage the investment. The Minister also had detailed discussion with the senior officials of the Ministry and chairman of Coal India Limited on the various issues in Coal Sector. A presentation was made by the officials of the Ministry to brief the Minister regarding the issues. 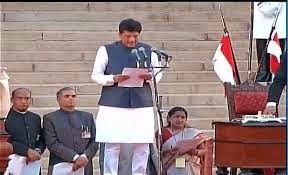 A rank-holder Charted Accountant and law graduate, Mr. Goyal has been on the Parliamentary Standing Committee on Finance and the Consultative Committee for the Ministry of Defence during his stint as Rajya Sabha MP from Maharashtra. He is also involved with NGOs in diverse fields such as tribal education and welfare of the physically challenged.